Today I'm joining in with Heidi from Fairy Footprints In The Sand. She hosts Magical Disney Sunday where you can link up your favorite Disney memories. Well, y'all know I love all things Disney! 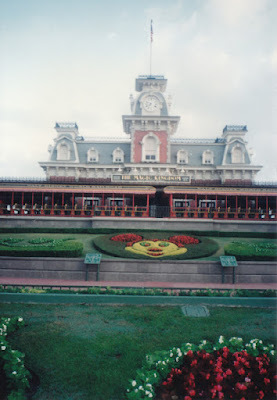 So in honor of my 17th anniversary that was yesterday, I'm going to share memories from our honeymoon at Disney World. This was the first trip for both of us, and I fell in love! Disney World is truly a magical place! The picture below is from the inside of Splash Mountain. It's gorgeous inside the ride. It tells the story of Brer Rabbit with different scenes telling the story. 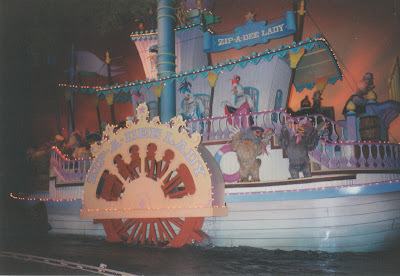 This is a picture of a paddle wheeler with different characters singing Zip-a-Dee-Doo-Dah. 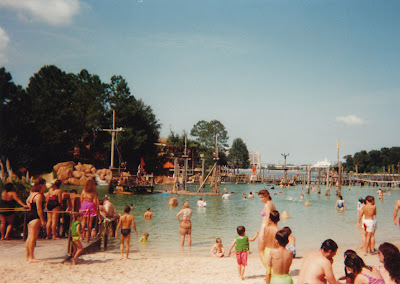 Do any of you remember River Country? It was the first water park at Disney World and was open from 1976 until 2001 when Disney decided to close it. It was supposed to be like an old fashioned swimmin' hole. It had water slides that looked like they were cut into the rocks, tire swings, and a sand bottom, just like a pond. We got to go there a few times before it closed. We stayed at Dixie Landings Resort on our honeymoon. They have since changed the name of the resort to Port Orleans Riverside. I guess you could tell from the name that it was southern themed and on the river. We rented a pontoon boat while we were there and explored the waterways and resorts and were able to go all the way to Downtown Disney. This is a picture I took of us on the boat. We were way younger and my hubby was rockin' the mullet, lol! Oh Nancy happy late Anniversary how wonderful. I loved your Disney post it was so much fun looking at the Disney pictures. I went to Disneyland as a child around 5 years old, I don't remember much now, but I do remember some of the rides, and I have wished ever since my kids were little that one day I could take them there, what a magical place to visit. It was truly a magical post. Happy Disney Sunday. A belated Anniversary wish Nancy. I enjoyed seeing your pictures and wish you both a great Sunday. Happy Anniversary it really seems like you two had a wonderful time! I would love to take my kids there but I think I will wait until they are a little bit older. Happy Magical Sunday. Have joined your following. Thanks for sharing your memories! I really need to get my family back down there...the kids were so young they don't remember going. Wow--your hubby looks way toooo young there! Y'all are too cute! The mullet is hilarious! Love the memories, I went to Disney Land or something in FL at age 13 or 14 with my Mom, Step Dad, little sister and older step sister. I honestly don't remember much from that trip other than the 24 hour drive to get there that my step dad did in 21 hours. Would love to get there with my kids to make some new memories that I hopefully will REMEMBER this time! Yes, happy anniversary belatedly! I too enjoyed the pictures of your first trip. Very belated Happy Anniversary. Loved your pictures of Disney and the memory. :) I have never been to Disney Resort or World, however we use to frequent Disney Land in California all the time and have lots of pics from then. It is a place that has a ton of magic, maybe one day I'll chat about how the magic brought my spouse and me back together. That was wonderful, Nancy! Happy Anniversary to both of you! Sorry I'm late, but happy belated 17th anniversary! Many more wonderful years together!